Castings, the introduction of liquid metal into a suitably shaped form and then allowing it to solidify, is a way to produce net-shape metal components. Unfortunately, the liquid to solid phase change at the heart of the process is accompanied by a change in volume, which is at the root of all the problems commonly associated with the casting process. In the extreme cases, this volume change on solidifications gives rise to gross shrinkage cavities or hot tears within the casting; this phenomenon is a problem for the foundry, but is well understood and can be corrected by a competent metalcaster, so that the end user of the casting need not usually take this problem into consideration. The traditional methods of gating and feeding castings are the foundryman's response to the volume change on solidification and represent an attempt to arrange for a liquid/solid interface to move through the metal in the mold cavity in such a way that defects in the casting are minimized, all the gross effects occurring within the gating and feeding systems which is then removed from the finished casting. Usually, micro-shrinkage still exists within the casting, weakening the material from within, but these age-old techniques result in a product adequate, and indeed often highly satisfactory for the applications in which castings are traditionally specified, - decorative objects and structural applications where a large safety factor can be designed into the component. 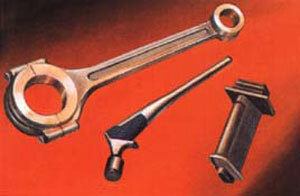 The logical next stage to widen the application of castings is the removal of this residual micro-shrinkage. The approaches used involve the narrowing of the liquid/solid interface and controlling the grain growth of the metal. Both techniques reduce micro-shrinkage by minimizing the restrictions to fluid flow within the solidifying casting, but the while effort is subject to diminishing returns. The ultimate narrowing of the liquid/solid interface occurs in directional solidification and single-crystal technology, but this makes for extremely expensive castings, and traces of shrinkage can still occur between dendrite arems within the metal crystal as the last metal solidifies. The last metal to solidify is surrounded by solid material, so that it cannot be fed from elsewhere, giving rise to shrinkage in the grain boundaries, and also to some extent, between dendrite arms within the grains. This micro-shrinkage, expressed as a percentage of casting volume, may be minute (less than .01%), but its effect on physical properties will be disproportionately high, because each tiny cavity is sharp-edged and often located in high energy areas of the casting. To compound the problem for the casting user, the feeding of the casting at this level represents a complex set of problems in fluid flow driven by a changing level of hydrostatic pressure within an environment (intergranular and ultimately interdendritic) of rapidly increasing complexity. The net result is that the variation in properties between apparently identical castings may be high, so that a safety factor must be applied. Thus, all castings may be said to have defects inherent in the process, and also to be inherently inconsistent in quality. This is the reason for the aircraft industry's "Casting Factor," requiring an overdesign (after other safety factors have been applied) for castings in airborne applications. Pressure can be used to close internal defects in metal components, as in forging. Mechanical pressing is not practicable for the complex shapes of most castings: Hot Isostatic Pressing (HIP), on the other hand, involves gas pressure on the heated components. It can be applied with no change to the cast configuration, and, whenever the applied pressure exceeds the yield point, the internal shrinkage cavities will be forced closed. If the HIP conditions are chosen correctly, the metal will then bond, thus "healing" the casting. HIP is widely used for this purpose when expensive castings in exotic alloys are specified, - rotating cast parts in aircraft engines, and critical titanium castings are processed by HIP. The closure of internal voids tends to improve mechanical properties, especially the notch-sensitive properties such as fatigue resistance, and naturally removes most radiographic defects. Most important, though, is the fact that the lower limit of the scatter band is raised by HIP processing, making the castings much more consistent in quality. HIP involves batch processing in relatively expensive equipment, but the use of a toll HIP service removes the need for capital investment, and intelligent use of the process can show enormous savings in production costs. For instance, the process engineer designing the gating systems can concentrate on filling the mold with the simplest gating system possible, improving casting yield and maximizing the number of castings to a mold. This in turn leads to lower finishing costs. Finally, the necessity for radiographic inspection is removed, with even further savings. There are many cases in industry where the cost of HIP of commercial castings is more than covered by the savings on X-ray film alone. Intangible savings, - peace of mind, represent added benefits of HIP. Hot Isostatic Pressing is unique in that it is the only known process which improves casting quality after the fact, in a predictable manner. Where is HIP Not Indicated? No improvement is possible in cases of non-metallic inclusions, (usually including entrapped gates), or cavities open to the surface of the casting. Allowing reduced gating and feeding. Reduces casting costs by improving yield per mold as well as yield per pound of metal melted. The ability to produce more consistent castings should open up new markets, enabling metalcasters to compete with other manufacturing processes, for example forging. Allowing the use of super-fine grain casting techniques. Several techniques are available for producing castings with extremely fine grain size, but the castings are unusually difficult to feed. After HIP, the full advantage of the fine gained structure can be realized. Inspection costs can be reduced, again due to the improved consistency. Salvage of reject parts. An obvious application, but probable the least cost-effective. © 2019 Pressure Technology, Inc.